The structural steel sector is responsible for designing the large structures of our world. Our lives depend on the efficacy of the structures produced by this industry, which adheres to stringent regulations. 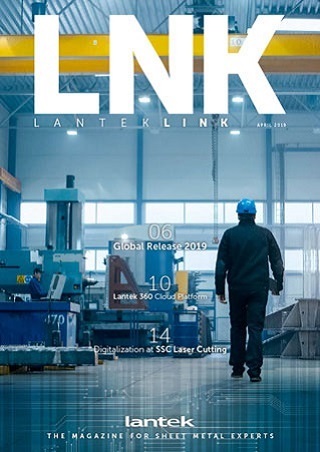 Lantek Flex3d Steelwork is sophisticated software designed to control the production and manufacturing of steel products and prefabricated structures. Lantek Flex3d Steelwork includes 2D and 3D design, CNC programming of profiles, integration with third party structural design software, and ERP capabilities to control costs and optimize return on investment. This module, when integrated with the Lantek Flex3d Steelwork System, facilitates the 3D CAD/CAM design and cutting of standard profiles including: I, U, L, H, T, and square or round tubes. 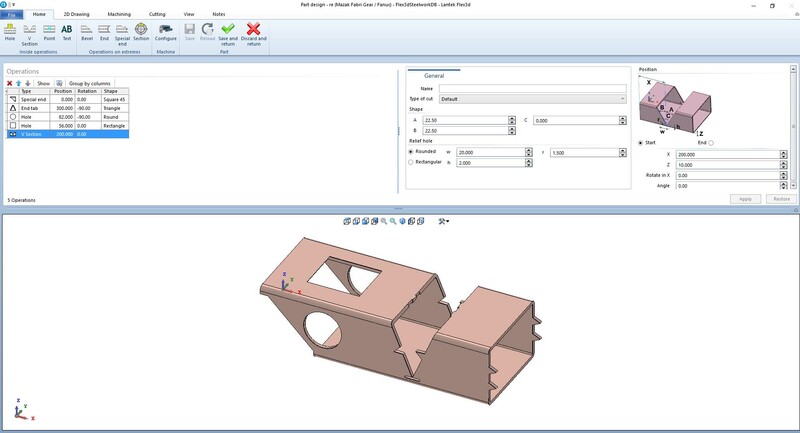 The automatic and semi-automatic features of the 3D nesting software maximize the use of materials and optimize the CNC code with collision avoidance technology as well as safe and efficient cutting operations on a wide range of machinery such as: sawing, drilling, punching, tapping, marking, oxy-cut, and plasma equipment. This is a module of ultimate flexibility that brings together design, manufacturing and production management. The harmonic created with this software permits companies to operate more efficiently, to deliver projects on time, to control costs, and to achieve profitability goals. Lantek Flex3d Steelwork is a system that includes database technology. 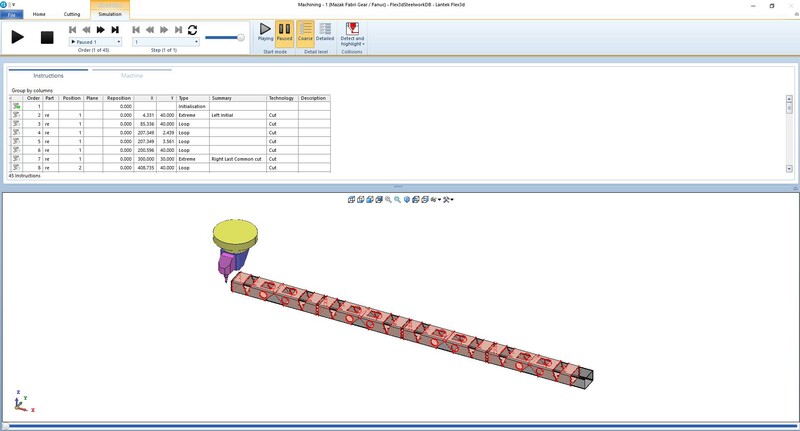 This eliminates the need for the user to continuously duplicate the entry of information to create a beam or tube section. The parametric technology of this system allows the user to select a base section and then modify the measurement. The result is complete management of different profile products and remnants that are rapidly available on file. 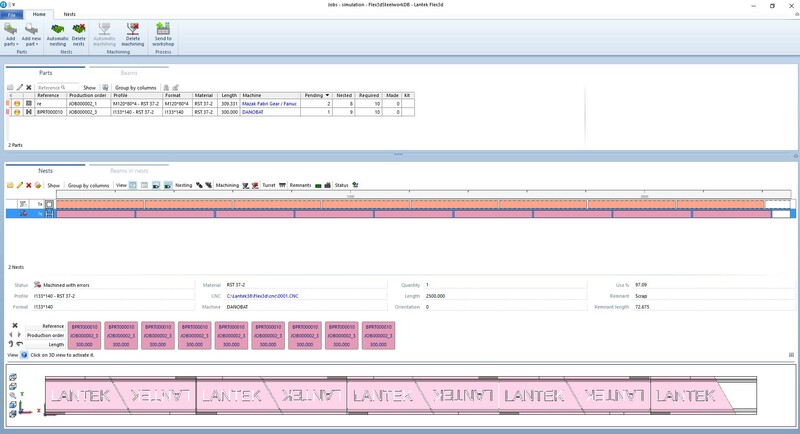 While Lantek Flex3d Steelwork may be a standalone product, it is maximized when integrated with the Lantek Manager and Lantek Integra Management Software Systems (MES/ERP). This integration incorporates features that start at the sales quotation level (jobs or projects) and continues with the launch of orders and production flow including: material needs, reservation management, purchases, and cost controls. The system has total traceability management. Lantek Flex3d Steelwork imports data generated by the leading structural steel CAD systems using DSTV, SAT and CAM files. The system converts the DSTV, SAT and CAM files into the native format for Lantek Flex3d, which easily allows the user to apply modifications. In addition, this module will import various properties of a file, such as the material, quantity and thickness -- all of which simplify the process for cutting preparation. Lantek Flex3d Steelwork allows the user to obtain the optimized profile path and to generate the CNC file for the machine. The system is optimized further by importing sections from the warehouse automatically or by calculating the supply needs. Lantek Flex3d Steelwork offers tools that automatically detect and control collisions as well as make manual modifications. Also, there are several relevant reports and process forms generated for the convenience of the user. Lantek Flex3d Steelwork allows the user to simulate each machining operation whether it is drilling, punching, the cutting head, or the work zone. 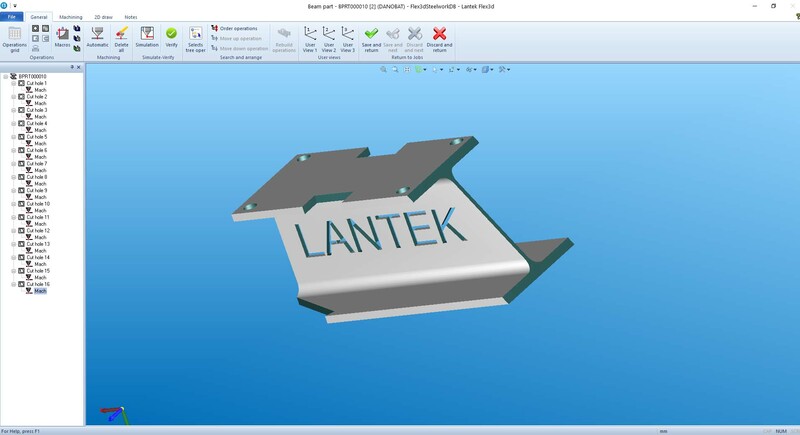 If the resultant simulation is acceptable to the user, Lantek Flex3d Steelwork will automatically generate the NC file for the machine and the user can view this data in the same environment. As seen in the illustrations, the simulation is of all machining operations and the trajectory of the cutting head (plasma or oxy-cut). When collisions are found, the user can repair them by stopping the simulation and correcting the trajectory. The user can see all of the parameters of cutting during the simulation and, while viewing, make zoom movements, rotations or axis positioning adjustments to the profile. Viewing is totally interactive during simulation with options for viewing step-by-step, forward or rewind.